The following six conversation patterns have been identified by communication experts Yvonne Agazarian and Anita Simon as the most important to recognize and change in order to communicate more effectively and authentically. Most relationships end due to a communication breakdown and thus learning these has the potential to dramatically improve your relationships success. The best way to learn this system is to take an introductory SAVI (System for Analyzing Verbal Interaction) course so you can practice hands-on in a structured environment. The next best thing is to buy the adjacent book read it and do the exercises in the book as well as the free ones online on the Conversation Transformation website. The following is mostly directly copied or paraphrased straight out of the book and will give you a general idea of what it’s about. The primary purpose of this post is to act as a quick summary cheat sheet to help simplify the awareness process so behavior changes can be done more easily. Much of the context and explanations are missing and can only be gleaned from purchasing the book, which I highly recommend doing. Hopefully the following will arouses some of your curiosity. To test your own conversation savviness take the free online pre-test here. They send two conflicting messages at the same time which makes it difficult for the brain to process. As a result..
People only hear the “but”. It’s human nature to notice difference so the “yes” part is usually lost. Artificial difference can be created and then become a source for further conflict. This strategy shifts the frame of the conversation to build and explore rather than creating sugar-coated opposition. Mind reads are one of three sources of primal anxiety in the SCT model. The important thing here is to distinguish between a projection and a perception. Mind-reads often occur when trying to read body-language so fact checking becomes extremely important. Another important concept here is also known as “reality-testing”. 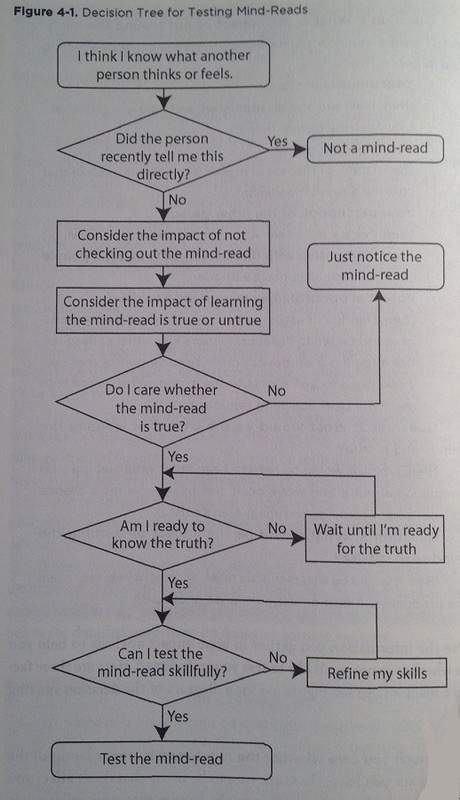 Mind-reads are assumptions about what other people are thinking or feeling regarded as facts. Mind-reads feed on ambiguity. The following are the most common factors that create mind-reads. State the thought you’re having. Negative predictions act like black holes, places where our time and energy go to die. Negative are also one of three sources of primal anxiety in the SCT model. When we make negative predictions, we treat our worries and fears about the future as if they’re facts.They are often thus self-fulfilling. Why do we sometimes expect the worst? The three primary factors that drive negative predictions are, attempts to manage emotions, reliance in fixed ideas, and generalizations from past experiences. Positive predictions while not as common can also be just as detrimental. Negative predictions have a lot in common with mind-reads as both involve constructing an imagined reality by treating our speculations as facts. Unlike mind-reads where an unknown assumption can be tested, here the future is inherently unknowable. Can I know whats going to happen in the future? Am I aware that l’m treating my prediction about the future as though it were already true? Have I had any positive experiences in past similar situations? When I’ve had negative experiences in similar situations, what factors contributed to those outcomes? What is different about my situation now, compared to similar past situations that ended badly? What factors in my current situation might impact the outcome l’m worried about? Which of those facts can I influence or control? What resources and options do have? What relevant facts am I missing, and how can I gather those facts? Knowing what has happened int he past, what could I do differently this time? What steps can I take to help prevent the outcome I fear and make a better outcome more likely? Are there any contingency plans I want to put in place? If l’m finding it difficult to sit with uncertainty, what can i do right now to help myself? Often the most important information we can receive is something we don’t want to hear: a disagreement with our ideas, challenge to our perspective, or objection to our plans. If you find you frequently don’t get that kind of information you may be using leading questions. Broad Questions: Open-ended questions that invite others’ thoughts, conclusions, opinions, or proposals. Narrow Questions: Direct, specific questions asking for facts or for yes/no or either/or answers. Leading Questions: Opinions in question form, implicitly seeking agreement rather than new information–or, in some cases, seeking no answer at all. Righteous questions: Attacks in question form, expressing blame, indignation, or outrage. The opinion makes it clear what the “right” response to the question is. Being asked a leading question puts you in a bind. If you give the “right” answer, you may feel like you’ve been coerced or manipulated, even if that answer is truthful. 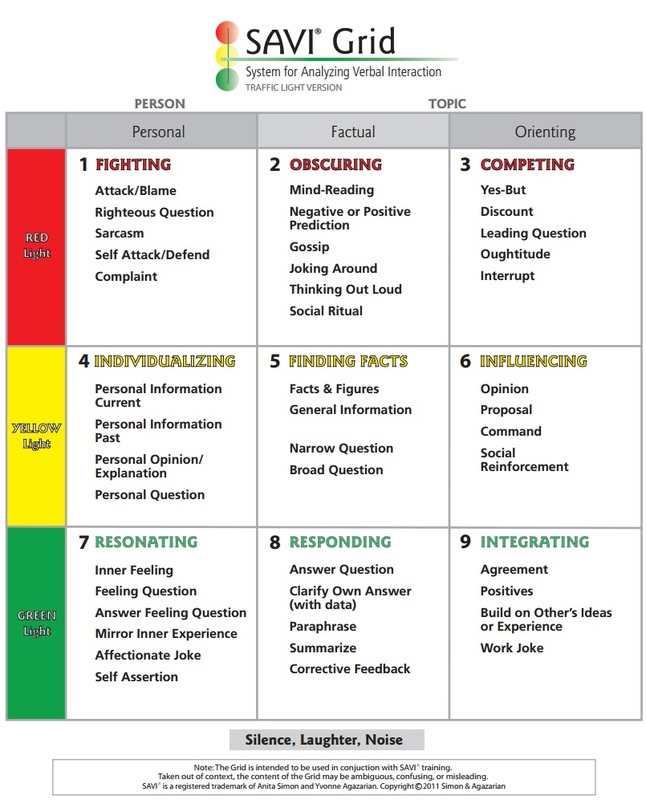 People who use leading questions are often seen as being pushy, closed-minded, or domineering. This type of pressure tends to provoke one of two opposing reactions: defiance or compliance. They discourage innovation and imagination and mask conflicts rather than resolving them. If used by a leader it can quickly create an “information vacuum” where no one dares defy the boss. Most people who use leading questions have no idea they’re doing it. Advertisements are chalk full of them. Separate the opinion and the question into two separate statements. A sense of hopelessness is the defining feature of this most common unproductive of communication. The main message is that some aspect of our life is unfair, too much, or not enough, and there’s nothing we can do about it. The accompanying voice tone is whining or frustrated. When we complain, we’re taking a passive role, talking as though we’re helpless victims of our circumstances. For many people a natural response to complaining is a yes-but contradiction. When a person is complaining, proposals from somebody else usually aren’t helpful at all. By suggesting that something will help, you’re telling the person that they’re wrong which often will just lead to arguing. Complaints are deceptive, diverting our attention from the true sources of trouble. The secret to understanding complaints is the following underlying issues. What proposal can you make to help get that to happen? This strategy helps shift the mindset from that of a victim to that of a problem solver. The goal is to replace feelings of dissatisfaction or resentment with a focus on a clear goal, and making proposals replaces passivity and helplessness with active effort. In regards to other complaining, it’s a shift in a person’s own mindset, not the introduction of new, better ideas from the outside, that makes it possible for them to stop complaining and start taking action. The goal here is to empower others to solve their own problems. Verbal attacks are often used when we experience anger, frustration, irritation, annoyance or other similar feelings. What’s being “honestly” expressed aren’t feelings but attacks. A feeling is an emotional experience, like anger, fear, or happiness. Direct statements of feeling like “I’m angry” are not attacks and usually not perceived as attacks by other people. Watch out for blameful interpretations that are feeling look-a-likes such as: abandoned, betrayed, rejected, ignored, criticized, put down, cheated, used or violated. Examples: “You abandoned me” or “You betrayed me”. Emotions do get communicated through attacks but not in a direct, clear way. They leak out through the blame in our words, the edge in our voice tone, or both. The feeling underneath “You’re being selfish” might be disappointment or anger. The feeling underneath “I feel betrayed” might be anguish or sorrow. Some attacks merge a feeling statement together with an accusation-for instance,”You made me really angry.” There’s a feeling in there (“angry”), but the main message coming through is blame (“you made me” feel this way). In addition to misleading the people who use them, attacks also mislead other people who hear them, including whoever is getting attacked. What drives us to attack is something happening internally: a strong feeling like anger or frustration. But the way were talking focuses all the attention on something external: a situation that’s upsetting us, a person who did something we didn’t like, or anyone or anything else were targeting with our hostility. Our own rnisdirected focus, away from our feelings and onto something else, will tend to mislead those around us. Goals that focus on punishing the other person or trying to make them change (ex. getting then to feel guilty or admit they were wrong) are unlikely to lead to a good outcome. When someone is yelling or raising their voice, staying calm and quiet is more likely to infuriate then than to help them settle down. Responding to an attack with self defense can be even more provocative. Attacking and defending go hand in hand, with each one tending to invite the other. Whenever people get stuck in an attack-self defend communication pattern, the defender holds as much responsibility for the breakdown as the attacker and has at least as much power to repair the breach. The primary information expressed in any verbal attack is about the person who’s delivering it. Only by reflecting another person’s feeling can you show that you’ve really understood what is important to them. The above 6 patterns are merely part of a larger comprehensive strategy used to analyze verbal interactions. There are 3 basic entropic things in communication that lead to “noise” and reduce the chance of information properly going through. If you say “yes, but” you are a closed system. If you are being ambiguous you are avoiding information content. If you are redundant you are avoiding the feeling emotion of what you are saying. The following grid categorizes all content of conversations. You can use it as a guide to figure out where you are in an interaction with someone. It gives you ideas of what square you may want to move in if you are finding there is a breakdown in communication.